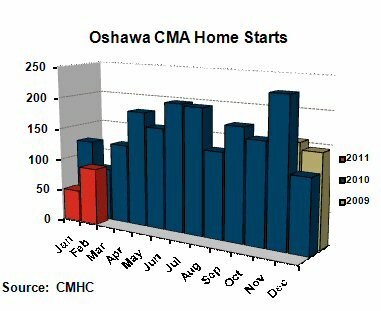 TORONTO, ONTARIO--(Marketwire - March 8, 2011) - Canada Mortgage and Housing Corporation (CMHC) released new home construction figures for the Oshawa Census Metropolitan Area (CMA) today. Total February housing starts, at 90 units, were around last year's level and the five-year average for this month. The single-detached segment experienced a 30 per cent decline in starts compared to February 2010. Growth in housing construction was primarily driven by 32 semi-detached units that started last month in Oshawa City. To view the graph associated with this release, please visit the following link: http://media3.marketwire.com/docs/cmhc0308oshe.jpg. "The Oshawa CMA provides a source of affordable single-detached housing in the Greater Toronto Area, which is attracting more interest from homebuyers. Furthermore, improved sales of semi-detached homes since the middle of 2010 are translating into increased starts of this housing type this year," said Inna Breidburg, Market Analyst with CMHC's Ontario Business Centre.